Last month, I gave the CalypsoCase Cabrio high marks, calling it the iPhone 5s/5 case Apple should have made, but didnt. 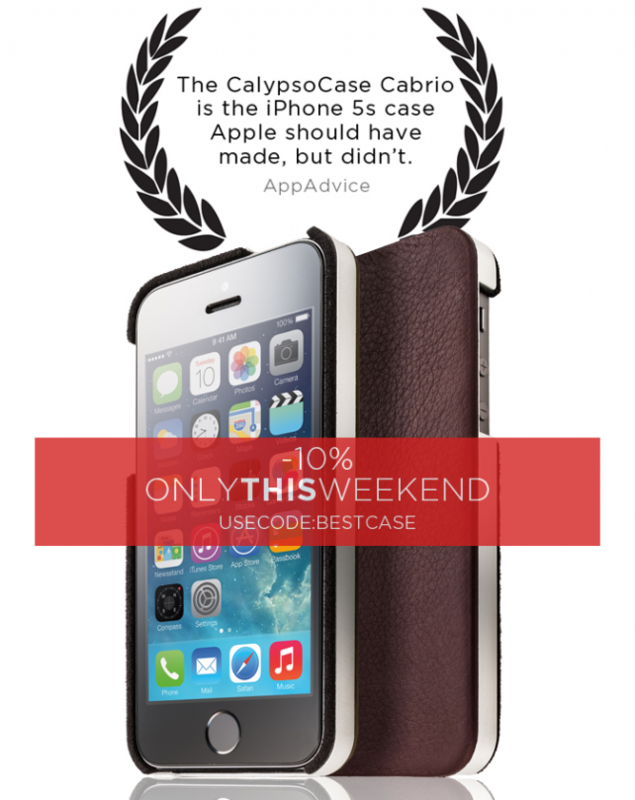 Thanks to that review, CalypsoCrystal is offering a special sale on all of its cases for this weekend only. Fashionable iPhone cases. Calypso Ring, titanium, leather and specially designed microfabric. Simply perfect. Aluminium body. Extraordinary leather. Perfect craftsmenship. The new CalypsoCase Book. Fashionable iPhone cases. Conite, titanium, leather and specially designed microfabric. Simply perfect. To take advantage of this discount, use the code BESTCASE at checkout. For my full review of the CalypsoCase Cabrio, click here. See also:The Mophie Space Pack Case ReviewandThe LifeProof Nd iPhone 5s Case Review.